Use its knockback to your advantage. 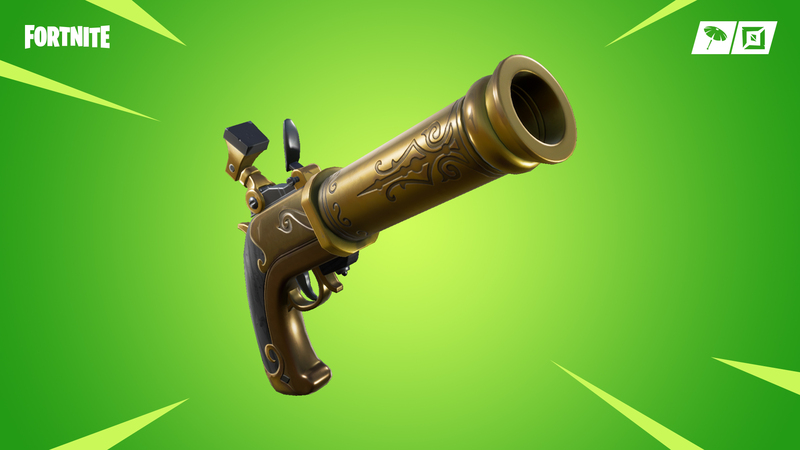 Fortnite: Battle Royale’s latest weapon, the Flintlock Pistol, became available today when the v8.11 update dropped early in the morning. Players could jump right into the action when they finished installing the patch since there was no server downtime. Those who already played a match since then might have noticed that the Flintlock is a unique gun. It’s the first weapon in Fortnite to have a knockback mechanic affecting both the shooter and the target that is hit. This may feel tricky and even sound like a weakness when you realize that shooting with it while standing on the ground will send you flying backward. But controlling this knockback is what apparently makes the Flintlock a strong weapon. Related: Epic reveals Blackheart Cup as Fortnite’s new online tournament with prize money. The knockback turns the Flintlock into a soft mobility item. Players can calculate where they’ll shoot to be knocked back at a specific angle to reach high ground areas, quickly disengage from complicated gunfights, or even engage in close-range combat by jumping onto opponents’ structures. The calculation for using Flintlock’s knockback for mobility should take into account that shooting straight down with no jump will make your character be knocked up about the height of one vertical tile, while shooting in mid-air will knock them up a bit over the height of two tiles. That means any shot that is diagonal to the ground will send you flying backward a certain distance, but your height should never go beyond two-and-a-half tiles. The only way to get past this limit is by chaining shots with other Flintlocks, but it’s impossible to chain further shots and keep your height stable due to its one-shot magazine and three-second reload time. If you try to do so even from great heights, you’ll notice that your character will eventually fall to their death because you couldn’t shoot in time. Even so, having one or two Flintlocks to increase your vertical and diagonal mobility might helpful. It’s far from being as useful as the now-vaulted Grappler, but it might help players to avoid and engage in gunfights whenever needed. If you prefer to use it for raw power, remember that it has a high damage falloff and might feel underwhelming at distance. Use it for close-range combat or just give up on that idea and consider it a mobility item.